I don’t know if everyone has a TBR pile like mine. It’s nearly as large as Everest. Some of the titles have been there for several years. Each summer I vow to catch up before I think of getting new books – but then a new title comes out that I know I must read and if I don’t get it now, it’ll be out of print… If you’re addicted to books as I am, you’ll know every excuse in my mantra. 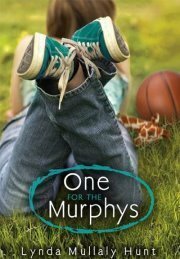 One for the Murphys by Lynda Mullaly Hunt was one of those books that have been waiting patiently for me to pick it up. Nudged by the July2, 2014 Nerdy Book Club post I began. If you have not read it yet, please don’t wait any longer. Go to the library, go to the bookstore, find it wherever you can and read it. It is the story of Carley Connor who seems to have lost everything. Released from the hospital into foster care, Carly feels frightened and alone. She sees herself as officially an outcast and feels completely out of place with the Murphy family. This perfect family that is everything she is not. Three boys – Michael Eric into super heroes and pretend, Adam into matchbox cars and Daniel into basketball and totally angry with Carley for taking his mother’s time and attention. Mr. Murphy, a Sox fan, is a fire chief and so it not always home and then there’s Mrs. Murphy, Julie, who’s always home, always listening and always genuinely seeming to care. At first, Carley can’t seem to understand the angle. She doesn’t fit and she doesn’t want to. But with time she learns a lot about courage, honesty, kindness and compassion. She learns the power of family and friendship. She discovers the strength of caring and tears. It is amazing how a life can change when someone pays attention to you first. I learned so many things by reading One for the Murphys that will stay with me about bravery, heroes and unconditional love. I will be a better teacher because of this book. I will slow down and take time to notice the wonderful gifts shared by my students each day AND I will let them know so they can become even more. One for the Murphys is a gift to read. Glad to know you’re there. Yes, it does. I love how Carley become more when Mrs. Murphy noticed she was strong, smart, capable. Makes me want to be more too.